PORTSMOUTH, NH, UNITED STATES, January 8, 2019 /EINPresswire.com/ -- Franchise Business Review has announced its 14th annual ranking of the top 200 franchises. To identify the top franchise brands, Franchise Business Review analyzed 18 months of data from approximately 30,500 franchisees representing 310 brands regarding their overall satisfaction with their brands and their likelihood to recommend it to others. The companies that made the top franchises list were rated highly in areas such as training and support, leadership, core values, general satisfaction, financial opportunity, and community. 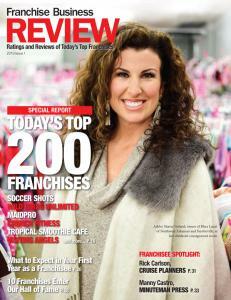 Visit www.FranchiseBusinessReview.com to learn more about this year’s best franchise brands. To request hard copies of the 2019 Top Franchises Guide contact Sarah Brady at sarah@franchisebusinessreview.com.